With a proven reputation of reliability, performance, and ease of maintenance the Sensor XP is the industry-leading vacuum for reliability and convenience. Featuring automatic brush-height adjustment, this machine efficiently removes soils that could ruin your carpets and hard floors, which saves you time and money. 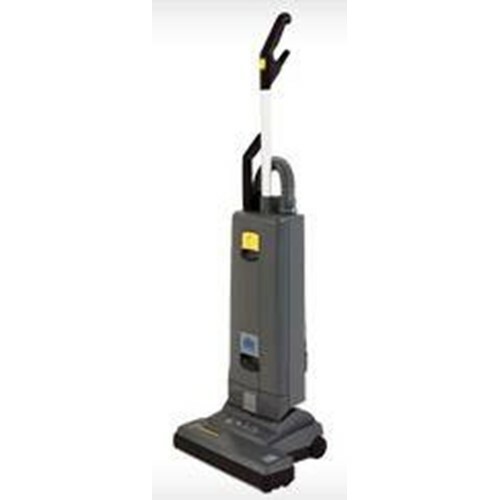 Trust the Windsor Karcher Group Sensor XP to clean your floors efficiently and reliably for many years to come. With 1200 watts of power, the Sensor XP vacuum motor pulls even more dirt and grime from your carpets. This machine utilizes a single 1.6 hp motor to cut down on handle weight in order to reduce operator fatigue and increase productivity. Industry-proven track record of durability and reliability. We have been building quality upright vacuums since 1979. Automatic brush-height adjustment to for optimum cleaning performance. Ultra-light handle weight allows for strain-free operation. Cleaning paths of 12, 15 and 18 inches are available to suit any need. Flat-to-floor feature allows for easy cleaning under beds and furniture. No-tool brush removal for easy maintenance. Detail cleaning tools conveniently located on the back of the machine. The Sensor XP comes standard with a high-efficiency filter that traps up 99.6% of particles at 0.3 microns. Optional HEPA filtration is available. Meets CRI standards for indoor air quality. Equipped with indicator lights to notify if the vacuum bag is full, brush height needs adjustment, or if there is a brush jam. Machine shuts down if indicator light are ignored for self-preservation. Quiet operation at only 69 dBA.